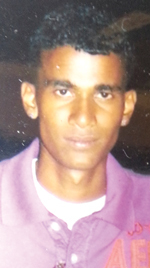 A Vive La Force, West Bank Demerara (WBD) motorcyclist is dead and his 18-year-old friend is nursing multiple injuries at the Georgetown Public Hospital Corporation (GPHC). This was after they both rode into a car that was parked on the Goed Intent Public Road, WBD at around 23:00 hrs on Saturday. Dead is 21-year-old Sunil Brijhuram, a construction worker, who sustained a broken right leg, broken arms and multiple internal injuries. He died around 02:00 hrs yesterday at the GPHC. His friend, Joshua Higgins, also of Vive La Force, sustained a broken left leg, head injuries and a severed right thumb, which was left in a drain at the scene of the accident. It is believed that Higgins and Brijhuram were under the influence of alcohol at the time of the accident. When Kaieteur News visited Higgins at the hospital yesterday, he had just come out of the theatre and was still sedated. The police in a release said that Brijhuram and Higgins were allegedly riding separate motorcycles at a fast rate along the roadway at Goed Intent when they both lost control of their bikes and slammed into the parked car. According to the police, they were rushed to the hospital where the 21-year-old succumbed to his injuries. Meanwhile, at the scene of the accident, one person, who claimed to be an eyewitness, explained that the duo was riding close to each other on the left side of the public road. He stated that Higgins first lost control of his motorcycle and collided with the parked car, and his now dead friend allegedly slammed into him (Higgins). The eyewitness said that because the men were speeding, the car was shifted by the impact and both men were hurled into the air and landed several feet away on the roadway. It is unclear if the men were wearing safety helmets. “All I hear is Blam! Blam! And dem man pitch in the air and back on the road. The bikes break up. We had to hurry and put them in a car and take dem to the hospital,” the eyewitness said. The owner of the damaged car, who is a policeman, said that he cannot speak to the media without the permission of the Commissioner of Police, Seelall Persaud. 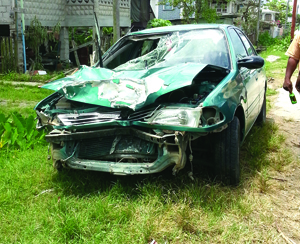 This was despite being told that the accident has nothing to do with the Guyana Police Force and it is in fact his personal vehicle that was damaged in the accident. Meanwhile, at the home of the now dead motorcyclist, his mother, Salima Brijhuram was visibly devastated. The almost inconsolable woman told this publication that the 21-year-old, who was the youngest of her six children, went home from work on Saturday and informed her that he was going out to get a haircut. “He come home back, he eat and he bathe and he take his bike and he went out. When the place get lil dark, my other son, who also went out, come in and I ask he for his brother and he said he left Sunil on the road,” the mother said. She added that sometime around 22:00 hrs, her husband called the 21-year-old and asked what time he would be home. “He said that he was coming and my husband called back around 10:30 (22:30 hrs) and he said that he was coming now and about half hour later, my daughter-in-law called and said that Sunil meet in an accident,” the older Brijhuram recalled. She added that her family immediately left home and went to the accident scene where they were told that the wounded men were already taken to the hospital. The car that the two motorcyclists collided with. “We went to the hospital and we get to see he…His eyes were open but he wasn’t really responding but I still talked to him and tell him that everything will be okay,” the woman said. 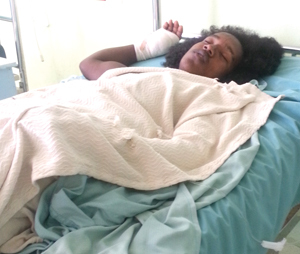 She added that she then left him in the GPHC’s Emergency Room and went outside. About 20 minutes later, a doctor informed her that he had passed away. Brijhuram leaves to mourn his parents and five siblings.